This is our totally cute Scubadorable Rainbow Parrotfish, a beautifully colored parrotfish that lives in the Atlantic. 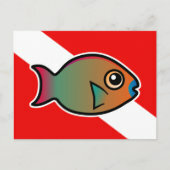 The design shows this beautiful reef fish in front of a dive flag! Great gifts here for scuba divers and snorkelers.